* Mariell's CZ wholesale bridal necklace set with brilliant 12 mm round solitaire makes the perfect bridal or bridesmaid necklace set for your wedding day. * Mariell's dazzling round CZ necklace set is plated in beautiful silver rhodium for the look of platinum and diamonds. 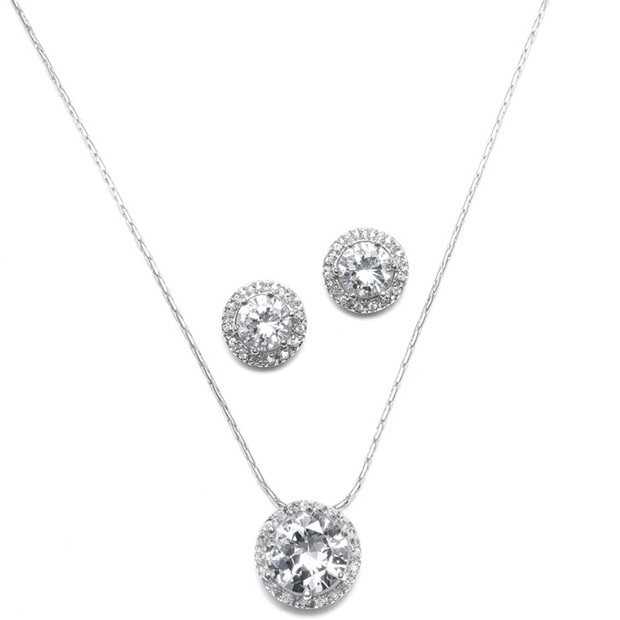 * This wholesale wedding necklace and earring set is a classic round design perfect for the bride or bridesmaid adding just the right sparkle to any formal dress. * The 12mm round CZ bridal pendant is framed with a circle of delicate inlaid stones and measures 5/8" wide. * It hangs gracefully from a 16" chain. * The 10mm CZ earrings are framed with dainty pavé stones and measure 7/16" wide. * The set includes a leatherette store display easel.